The fungicidal effects of copper compound have been known for many years since the important discovery of ‘Bordeaux Mixture’ in France in 1887. The mixture of copper Sulphate and Calcium Hydroxide is a good non-systemic fungicide capable of controlling fungal diseases of Cardamom, Coffee, Rubber, Vegetables etc. This copper compound with lime give a protective barrier on the plant surface, there by preventing fungi from entering the plant host. The copper ions react with the sulphur containing ligands in the enzyme of the plant and inhibit the metabolism of the fungus. This effect has many sites of attack so the fungi rarely build a resistance to copper based fungicide. The quality and effectiveness of Bordeaux mixture depends on the purity of copper Sulphate and lime and also on the method of preparation. It is tricky and more tedious for a common farmer. Moreover the Bordeaux mixture deteriorate on keeping and has to be prepared fresh every time. In order to overcome these hurdles, Biota Agro Solutions developed a ready to use Bordeaux mixture in the form of a micro fine powder having all the properties of the conventional Bordeaux mixture. 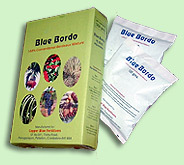 This tailor made product having the brand name “Blue Bordo” is an excellent protective fungicide. Bordo mixture of any desired concentration including Bordo paste can be prepared from this by changing the quantity of water / kg. Biota manufactures this ready to use powder from high purity copper Sulphate and hydrated lime with special technique and under strict quality control. 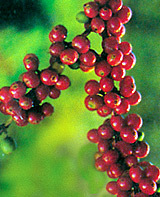 Uses Blue Bordo is a powerful fungicide and is extremely used in coffee, cardamom, pepper, aracknut, vegetables, grapes etc. Packing 100gm, 500gm., and 1kg packets and 10kg bags. Cuprous chloride is a stable compound of univalent copper. It is having the chemical formula Cucl. This white crystalline solid is highly soluble in water. Cucl is very sensitive to heat and light. It can turn into yellow followed by reddish brown cuprous oxide in presence of moisture. Commercially Cucl is manufactured by the reduction of Cupric Salts. The product has the following specifications. 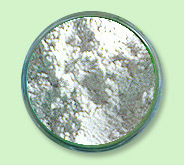 It is used as a starting material in the preparation of CPC Blue which is a well known pigment. It is also used in Nylon tyre cord as spinning additive. Many Organic reactions use cuprous chloride as a catalyst. Petroleum Industry uses Cuprous Chloride as a decolorizer. Packing 25kg. H D P E drums having polythene liners.